Alterations & Extension to existing school including new staffroom, office,classrooms & resource rooms. Various ongoing works including access upgrade works & major site development works. Various upgrade & Extension works, internal alterations(protected structure) and the provision of ASD accommodation. New players facilities, hockey pitches, training pitches & changing rooms. 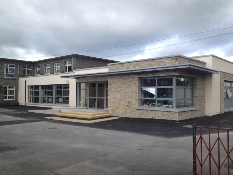 ST. JOSEPH’S SCHOOL, MOUNTMELLLICK New single storey Extension with new entrance, two classrooms & resource room.